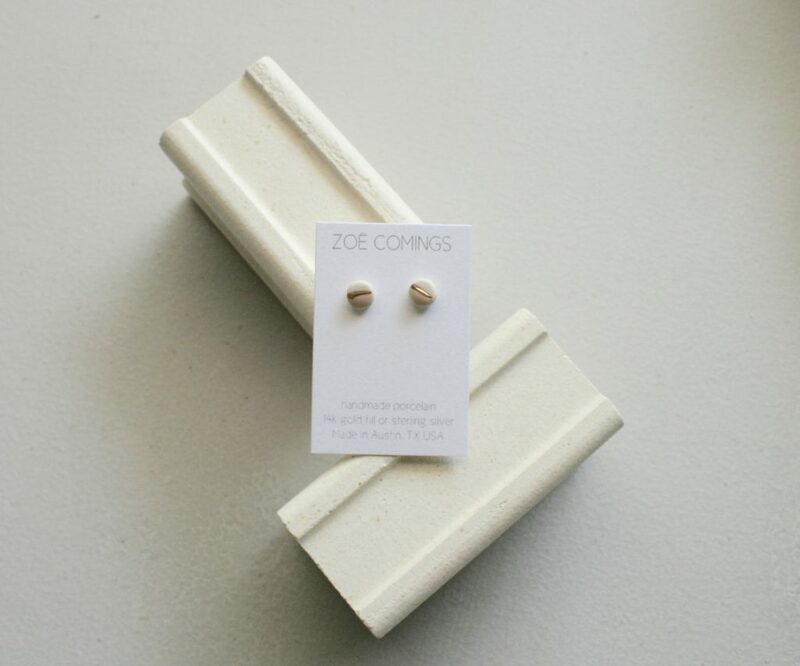 One look at ZOË COMINGS jewelry and you’ll know immediately that you’ve stumbled upon something truly unique. 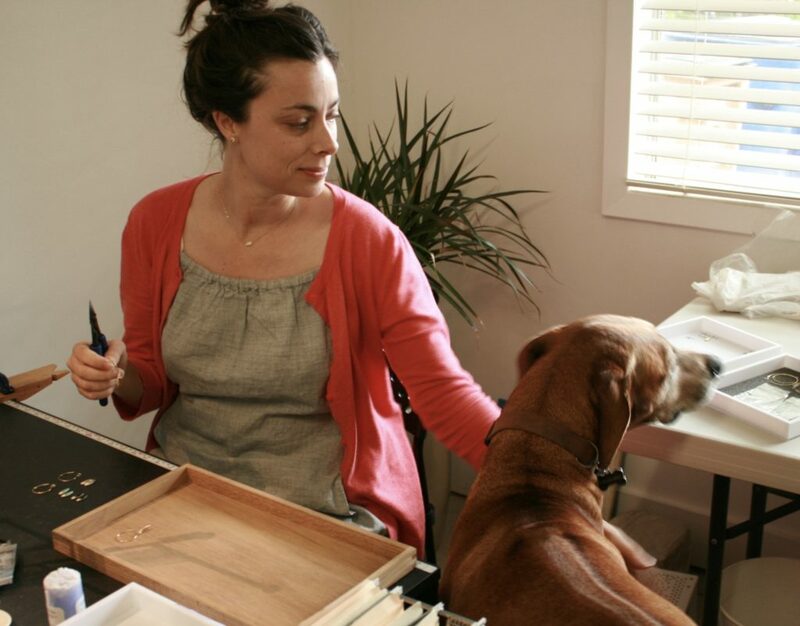 Since starting her namesake jewelry line in 2012, Zoë has made a name for herself and her brand, which she sees not only as jewelry, but also as art. 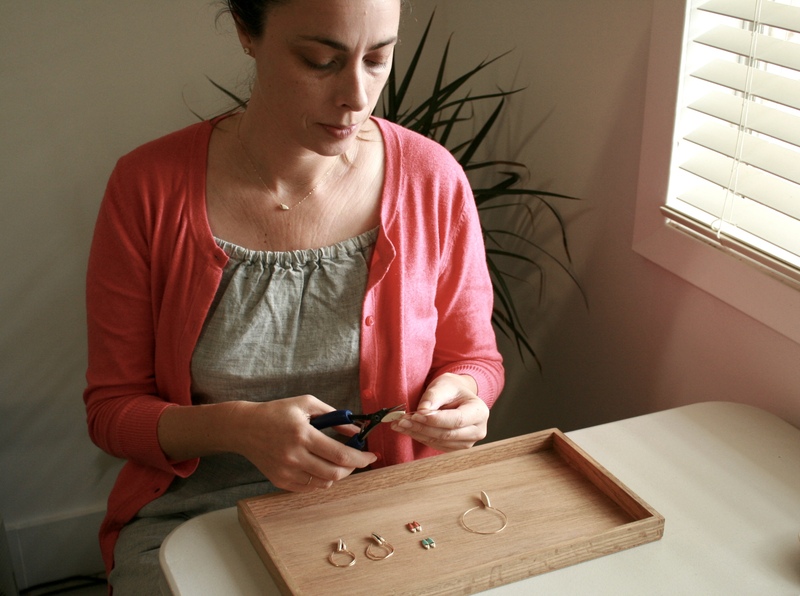 With a focus on slow fashion and high-quality design, her handmade porcelain jewelry combines design, art and fashion to create one-of-a-kind studs, earrings and necklaces which have been seen in Anthropologie, Lou & Grey and more than 50 shops across North America. I have known for a long time that I wanted to work for myself. You know how kids play house? I had a friend who always wanted to play house and I hated that — until it was my turn, and then I was like ‘I’m the boss and this is a factory.’ I think somehow, even though life went all these different ways, I don’t think I knew for a long time that this is what I wanted to do. But when I look back, I think I did know. For me, the most challenging part was to figure out how to market myself — like what direction I wanted to go in initially. Whether I wanted to go into wholesale or retail, how I wanted to target my audience, which direction I wanted to start in for growth and what that would take investment-wise. What has been the most unexpected part about having a business? One was [how] my business grew. You can’t control the rate of growth of a business, so I didn’t know what to expect. Now, almost 5 years in I can kind of understand the ebbs and flows and what to project a little bit more. Another unexpected thing is I didn’t realize how much I would teach. Training people is like being a teacher. Maybe there are other ways to go around it but for me, I’m a teacher. I didn’t realize how much I would learn about that and different personalities. My parents are both teachers and I swore that I would never be a teacher, but it found me anyway. How do you deal with competition? How do you remain true to your brand? I think it’s good to be aware of what else is out there. Just like anything – fashion or art or architecture, it’s nice to look around and be inspired by things. I try not to look too much at social media or other things so that my own inspiration is untainted, if you will, and more truly my own. With competition, I just feel like art is so unique, each thing I design is going to have my own touch of hand to it. I remain true to the brand in the sense that, when I started this line I had a mission statement that I wanted to create a line that was handmade, designer quality. Working with fine jewelry kind of influenced the line so, even though it’s a fashion line, there’s an element of classic modern aesthetic that is really important for me to bring in. The wearer makes it their own when they wear it and it brings out their own authentic style. I just hold that with everything I design and try to think of who can wear it but make it within my brand aesthetic. 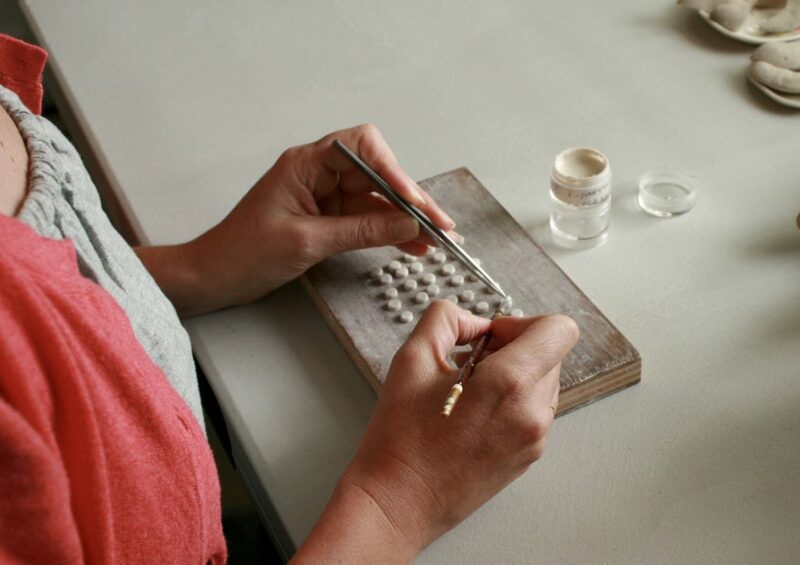 How has the local community of artists and makers supported you? I feel really fortunate that there’s a large group of makers and small business owners in Austin. I don’t think everybody has such a big community. Even though we all work separately, there’s a small group that I know I can call on or meet up with for coffee. There’s camaraderie there. Pay your taxes! It’s true. There’s a bunch of business advice but some of the points would be, to have goals — make sure you have some goals that are relatively achievable and some goals that keep you stretching and reaching. Have goals, otherwise you don’t know where you’re going. Another is (it could just be for my own sanity) to take the time to set up systems from the beginning. Set up pricing, find a good bookkeeper, all these things that are not what we see as fun, but will save you a headache down the road. When you feel yourself getting overwhelmed or stressed with the business what do you do to put it back into perspective? I think it has more than one answer — I think it depends on what it is. Usually it helps me to be outside. Take a break, walk away from whatever the current stressor is in the moment. It also can help to break it down into parts and backtrack if it feels like it’s a large stress. But I think as a small business owner, and it’s something I’ve worked at, it’s really important to take enough time for yourself. You’re more effective to staff, yourself, the business, the customers if you’re well-rested and inspired, and not tired and overwhelmed. It’s key to catch it before you get overwhelmed. 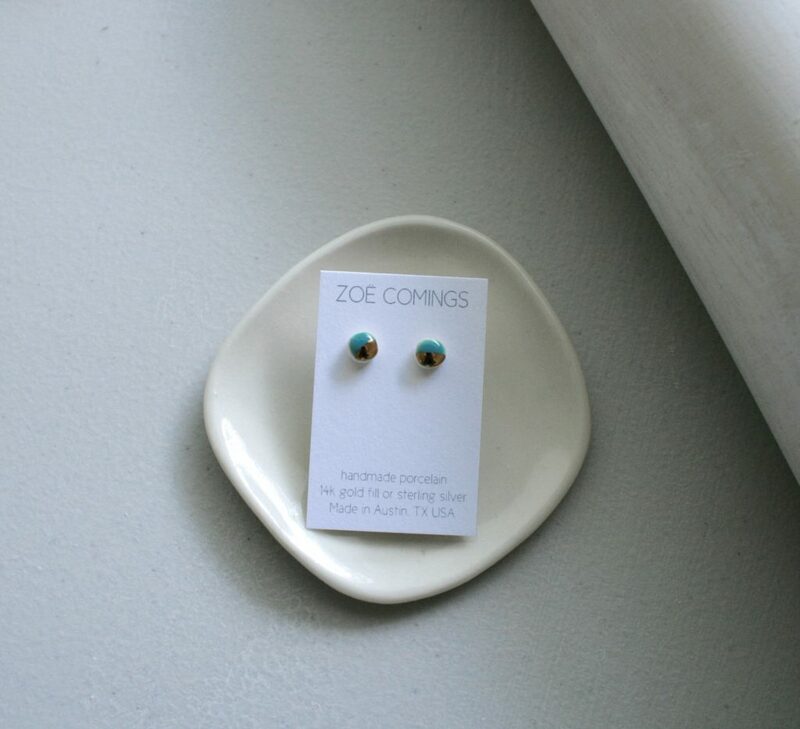 Over the next five years, what do you see for ZOË COMINGS? I see expanding the studio and expanding the line. 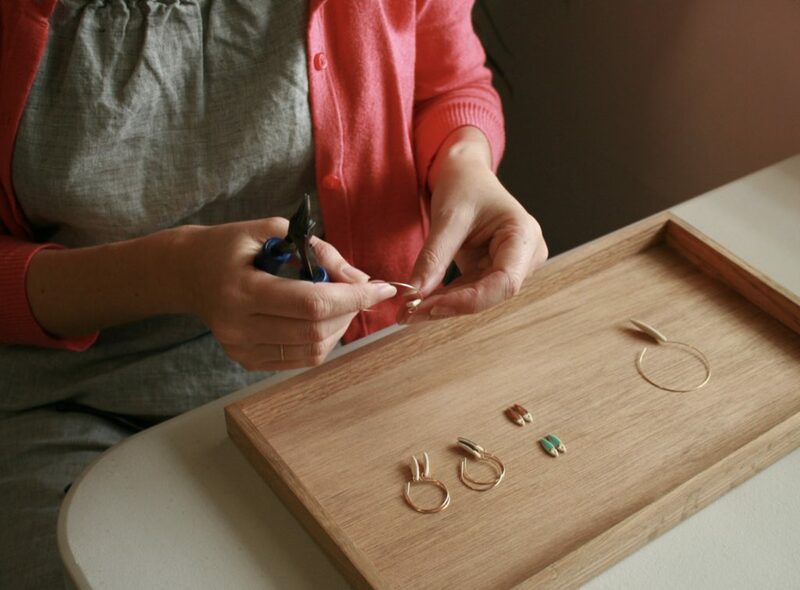 When I started this line I had a vision of some other avenues I wanted to explore, so now that the production of the jewelry line is up and running, I see some employee growth and having that be an entity that can run on its own. Possibly open a showroom here in Austin, or elsewhere. And then focus on expanding the line to encompass these other creative projects, like home. I love going to Red Bud Isle because I have two dogs and there’s something very relaxing about it. I love it as a rest and rejuvenate place. This sounds kind of silly, but I also like boutique grocery store shopping. I find it relaxing to cook and Austin has so many good boutique groceries. Picking a recipe and going out and choosing some fun, quality ingredients is fun to me — vinegars and salts and stuff like that. It’s something not very many people know, but I could spend an hour in the cheese shop.